Things you can do in case of an HVAC or plumbing emergency at home. Saving your plumbing. And getting back to normal. Plumbing and drain problems never happen at a good time. In fact, it can often seem like they only happen in the middle of the night—or just before holidays and special occasions, when your home will be full of friends and family. That's when it's time to call in your local ARS®/Rescue Rooter® emergency plumber to take care of all your emergency plumbing needs. We're your first call in the event of an emergency, but you can also take steps to mitigate potential damage before emergency help arrives. Make sure you know where your water shut-off valve is located, and check out our handy tips for emergency DIY. Nobody likes to wait for a plumber to arrive—especially during a plumbing emergency. That's why we're committed to providing prompt plumbing service 24 hours a day, 365 days a year. And don't let the speed of our response fool you: ARS/Rescue Rooter plumbers are trained experts and take pride in their work, which is always backed by our Exceptional Service Guarantee. 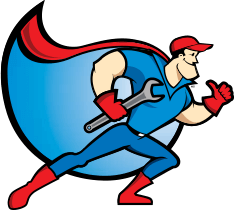 Call now for a fast response, and check out our plumbing Home Service Plans and learn the benefits of preventive plumbing maintenance and reduce the need for emergency plumbing calls in the future.